Every now and then you encounter a book which leaves you part excited, part frustrated. 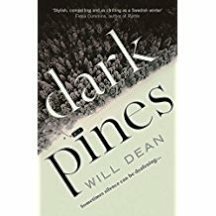 Dark Pines is one on those books. It is a debut effort from a Brit who has had the good sense to flee to Sweden for his inspiration. The setting is small town Sweden, a place called Gavrik which boasts a liquorice factory, a pulp mill, a few shops and a nearby motorway, which transports locals to a lap dancing club, once the local brothel, before leaving the town to its laurels. More than that Gavrik boasts a community newspaper which provides employment for Tuva Moodyson, a deaf reporter. Tuva has also washed up in Gavrik after time in the UK working for the Guardian. Ostensively, she has returned to Sweden to be near her dying mother, though there are hints of additional reasons for leaving London. Even in the remoteness of Gavrik and the Utgard Forest Tuva has retained her journalistic ambitions to find that one big story which will make her name, win her awards, and propel her back into the bigtime. The opportunity arises when one after another hunters are discovered dead in the dank, dark pines of the Utgard forest after being shot with hunting rifles. Additionally, their eyes have been gouged out, which reminds local police and residents of similar murders committed twenty years earlier which remain unsolved. While the police set about finding the killer, or killers, Tuva concentrates on the human interest, the impact the murders have on the local community. Even though the two quests often interweave, it is this separation which generates the first element of frustration. Tuva repeatedly visits the four residences which edge the forest: that of the taxi-driver, a dead shot with a rifle who lives with his withdrawn son, the two sisters who carve out a living producing hideous trolls complete with human hair and other attributes, a reclusive writer who makes a living penning books for other to claim authorship of, and finally the couple consisting of Tuva's best friend and her husband who manages the pulp mill and heads up the local hunting fraternity. Whilst these are the people most affected by the murders they are also, to her mind, the most likely suspects. That possibility is confirmed when she discovers one of them had been interviewed by police on suspicion of the earlier murders. Meanwhile, the police investigation continues obliquely with the police keeping their cards close to their chests even as the additional murders attract national press coverage and their secrecy increasingly frustrates Tuva and her press colleagues. Hence, the book skirts round the usual stuff of crime fiction – the murders themselves and the police investigation, leaving Tuva to drive her truck from here to there, sometimes venturing out on foot, or by bike, into the pines, most of the time hooking and unhooking her hearing aids and musing on either the pastoral symphony of the woodland or the poetic silence when she opts to dispense with her hearing aids. Being deaf myself I would normally identify fully with a hero with similar problems. But as worthy as she is, Tuva did tend to exhaust my sympathy with her frequently trivial pursuits. The story too has similar issues. There is nothing wrong with the wonderful way Will Dean paints the bleak forest and its almost claustrophobic effect on a local community trying to compete in a global economy which is increasingly diverting its benefits elsewhere. And, by and large, there is little wrong with the warts and all characters who emerge out of this gaunt landscape. But for all that, the storyline evolves flatly and evacuates any real drama until the final chapter. When that drama does finally explode, the effect both gratifies while convincing you some of it could have been diverted to the earlier chapters. So a promising start for Will Dean which will no doubt draw comparisons, justified or otherwise, with the likes of Hoeg and Hankell.